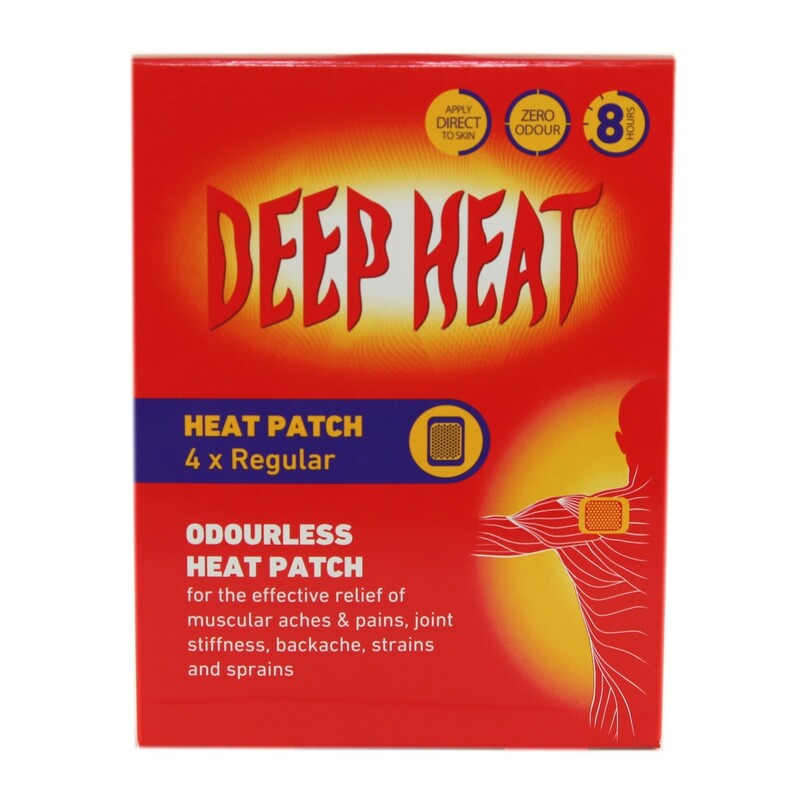 Deep Heat Patch delivers up to eight hours of deep relieving warmth directly on the site of muscular aches and pains, joint stiffness, backache, strains, sprains and menstrual cramps. When muscle spasm or tension is caused by local lack of oxygen - for example, after exercise, the increase in local blood flow induced by heat can reduce the feeling of pain by bringing more oxygen to the area. Pain-sensing nerves are stimulated by natural body chemicals, serving as a warning of damage to tissue - an increase in local blood flow removes these chemicals, so reducing pain. Heat also increases the ability of collagen, tendons and ligaments to extend, so gentle movement of affected areas is less painful. Tear open plastic packet, remove protective film from patch and apply patch to the affected area, adhesive side onto skin. For delicate or aging skin, apply adhesive side of patch to clothing.On flexible joints, use dressing tape to hold the patch in place. Do not bandage over the patch.The patch will heat up after 5 minutes and remain warm for up to 8 hours.Use only one patch on the same area in 24 hours. Do not use: Whilst asleep or with prolonged pressure against patch. On infants, children, or persons unable to remove the patch on their own; With other skin medications or other heat sources.If you are diabetic, pregnant, have poor circulation, nerve damage or a skin condition, consult your doctor before use. Thank you for your interest in Deep Heat Patch. Enter your email and we'll contact you as soon as it's available again.